UPDATE: Two days working under the oleanders in moderate temps (85-degrees) wearing the Comp-Tac, and and the sweat has helped soften the leather and make it more comfortable. 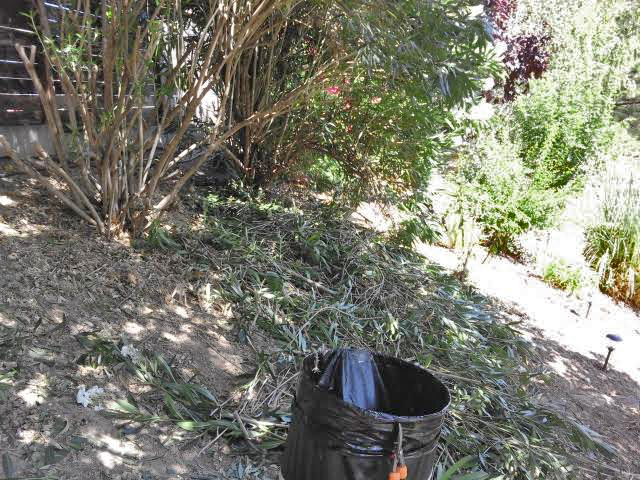 Plus I got six yard-bags filled with cuttings and the silk-tree is becoming more visible. I know oleanders can-or-are supposed to cause a reaction since they’re poisonous, but I’m wearing gloves and guess I’m not getting any of that. I’m sorta on the fence about the laser-pointer. On the one hand it’s great in the dark, it’s tiny and doesn’t add weight and you don;’t need to use the sights — but on the other it adds an element of doo-hicky-ness, and the Comp-Tac holster combination isn’t breaking in very fast. The additional wide-dimension and bulk that the laser-holster requires spreads the pressure-points around a wider arc (good) so it takes up more space (bad). One of the belt clips is nearly center-of-back. 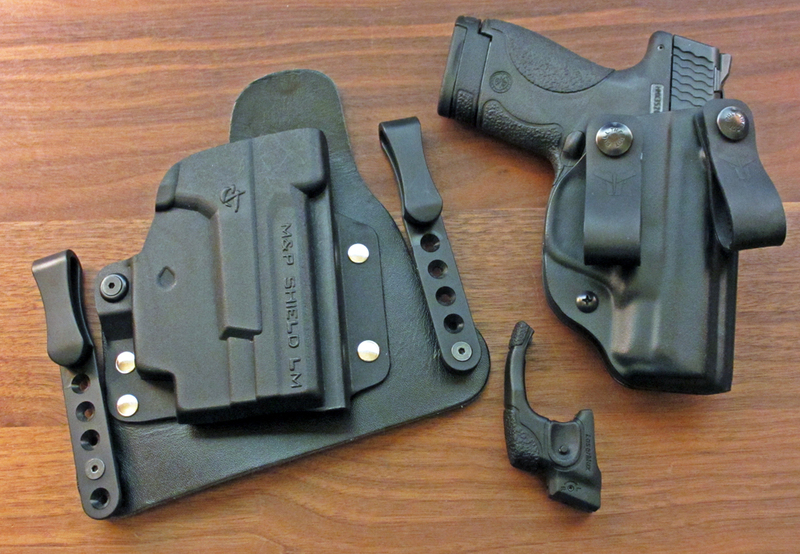 The Blade-Tech Nano holster is smaller and more comfortable to wear on a constant basis, but the stiff polymer isn’t THAT comfortable in certain positions, like driving, however it is smooth and that is nice and the retention click is very good. Maybe I need a second, “Night Gun” with the laser. Maybe I need to wear the laser-holster combo when I’m out cutting into the oleanders and get all sweaty in order to break it in faster. There are belt-loops instead of clips I can get for the Comp-Tac that might make it fit better, if I can get them to attach – they’re not directly made for this model. Another night of class, more with respect to Archery, and then the situations and conditions faced by hunters accompanied by anecdotes by Mac who has hunted all-over: like is it a cow or a buck or a yearling, is that duck flying by a male or female? But mainly, PPPPPP – Proper Planning Prevents Piss-Poor Performance. Like having the paperwork for your California horses’ significant markings and gum-tattoos – or whatever they use to identify them – can enable you to continue to your hunting destination when stopped by Colorado Game Officers concerned with horse-thieves. And having somebody in camp with a Bear Tag when you’re forced to shoot one in self-defense or defense of the camp. Old Mac had a whole slew of stories and experiences to share with us, both as a hunter taking game from California to Alaska to Idaho to Colorado – and sa a 30-year Highway Patrol veteran. Because it is Regulations that set the Standards and Procedures, and those drive the outcomes and determine the results and effects of interactions with Fish & Game Officers – and as usual, ignorance is no excuse in the eyes of the law… So you have to know the critter. Know is it male or female, what its age is, what makes it eligible to take as game, what the area you are in allows, and what time of year you can take game. If you thought the Gunsteroonie Ninja-SWAT Shoot-House with shoot-no-shoot targets was tough, wait till you sneak up on an underage deer with pointy little antlers that smells you coming and is moving around to avoid you, one that blends in perfectly with its surroundings. In other words, it’s no walk in the park cow-shooting, you have to know a lot about the game you’re hunting, and how to identify it correctly AS game. Or risk a hefty fine or even imprisonment. And then you have to gut, clean, and dismember the carcass before the meat spoils. I dreamed I got the Magpul SGA shotgun-stock and set-up the Mossberg to run Lefty. I think because I’m still harboring uncertain thoughts about the right-handed (or wrong-handed) GG&G rear-QD mount. Also it came up (in Dreamstate) that I’m visually cross-dominant. True enough, my left eye drives my cerebral cortex – or something. Anyhow, so I was dreaming away in Fantasyland that the sling fit better and I could manipulate it easily (some fantasy that!) and roll it to the side to stuff-shells into the bottom, and do the Shell-Shucking Dance of the 3-inch chamber. And when I awoke I actually remembered my dream. Democrats are by definition Divisive. They NEED #Feminism to incite anger and keep 51% of the population off-kilter and angry at Men, and for Men to be on the defensive. They NEED and use #Race to incite People-of-Color to anger, and maintain an edgy and UN-equal stance against ALL people of Non-Color. They use impressionable #Youth with all their naivety and inexperience to fight against the #Elderly – over property and their decades long accumulated materials because they hate Equity, earned and derived over time – and also hate Compounded Interest. They use … and there I lost the thread. So long story short, it didn’t take. I can’t do it, but it seems like good a practice-item/agenda-issue though. Doesn’t work for me with the AR either, I tried.